To view information and images of an Advocate body, modified for use with a Watson Barnet microscope attachment, see below. The above pictures show a Series I Advocate (LHS), which went on sale in summer 1949, and a Series 2 Advocate (RHS) that was first on sale in 1953. They were manufactured by Kennedy Instruments, a wholly owned subsidiary of Ilford Ltd, who later manufactured the KI Monobar. They also manufactured the ILFORD filmstrip printer. The above picture of a Series 1 Advocate, and the others lower down this page, are shown by kind permission of Michael Rickards. The Series 2 Advocate picture, and the others lower down this page, are by John Dodkins. The body colour differences in the examples above may be genuine or may be a difference in the 'colour balance' of the cameras used to take these pictures. But it is known that colour variations exist, going from white to ivory and cream. Notice the two black flash synchronisation sockets to the lower right of the lens on the Series 2. For a pdf file of the Series II Advocate instruction manual, click the image alongside Be patient as the file is 8MB. 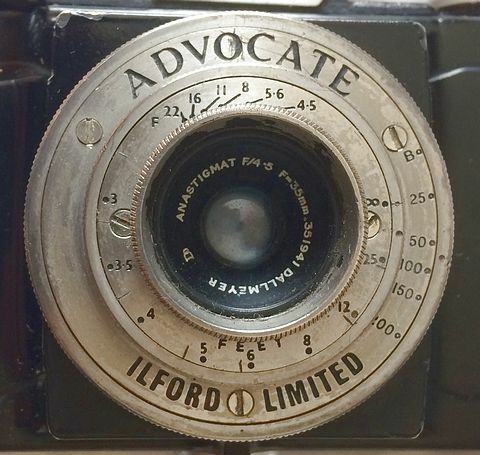 "The 'Advocate' is a landmark in British camera construction. As pleasing in appearance as it is accurate in construction, it brings the precision miniature into the medium price class and gives the lie to the assertion that we cannot hope in this country to compete in the miniature market. The body is a pressure die-casting of aluminium silicon alloy, finished in hard-stoved ivory enamel finish which is delightful to handle, extremely resistant to scratching and wear, and absolutely incapable of picking up dirt. The lens, too, is out-standing. It is a bloomed Dallmeyer British made f/4.5 of only 35-mm. focal length, a wide angle coverage which, at f/4.5 on so short a focus, gives a depth of field that renders a rangefinder unnecessary for the great majority of work: for portraiture and other work in which a smaller angle may be appropriate the perfection of the Dallmeyer lens permits of adequate definition by enlargement from rather less than the whole frame. The shutter is timed for 1/25, 1/50, 1/100, 1/150, 1/200, and bulb. Shutter speeds are set out on the outermost ring; the inner ring gives, on a very open scale, focus down to 3ft., while the iris is controlled by rotating the lens hood, and is graduated to f/22. 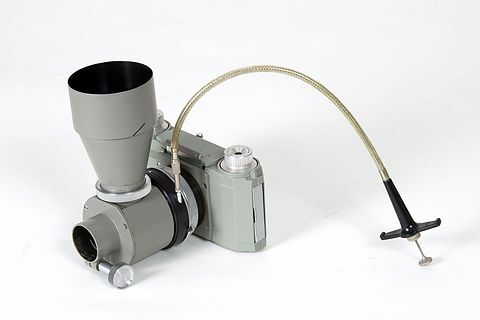 The shutter wind and film transport are interlocked, and the mechanism is freed for rewinding by depressing the winding head: it is very comfortably done with the second finger of the left hand holding the camera, rewinding being done with the right. The camera takes standard cassettes and loading is simplicity itself, thanks to the provision of a swing-out holder for the cassette. 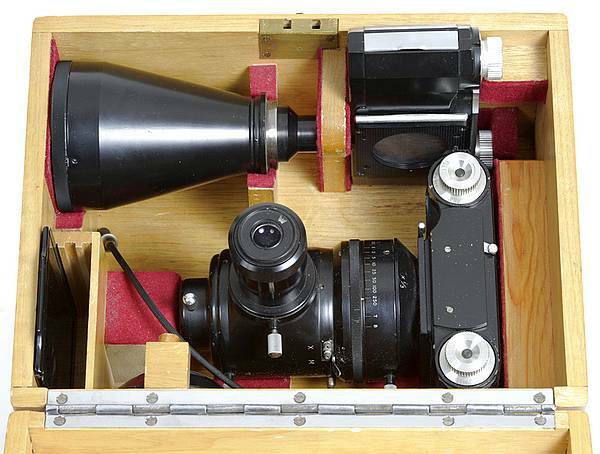 The optical view-finder is adequate, well made, clear, and with a quite well-defined frame. A tripod bush is provided in the centre of the base-separately inserted into the body casting, solidly designed and of adequate depth. Eyelets for a sling are cast in the body itself, small and unobtrusive. Altogether the camera gives unquestionable evidence of the very highest quality. The interior of the body casting is as clean and precise as a plastic moulding, and everything is attached with screws, with obvious precision. All parts are made dead to gauge, and the lens adjusted accurately to gauge by the makers, so that there can be no error when all is assembled. A final check after assembly nevertheless makes assurance doubly sure. The price of the camera is £15 15s. Od., plus £6 16s. 6d. purchase tax (total cost £22.58p); the ever-ready leather case (with provision to hold 2 filters) is an extra and costs £1 19s, plus £1 5s.4d (total cost £3.22p) purchase tax." Tony Kemplen, in Amateur Photographer magazine, 2nd February 2013 edition, presents a short article on page 82 desctribing week 4 in his "A Collector's Life For Me" series. He recounts his experiences of using a Series 1 f4.5 Dallmeyer lens Advocate and shows a number of photographs on his Flickr page taken with his Advocate. Tony's pictures were taken during week 4 of his "52 cameras in 52 weeks" project. A Series 1 Advocate at the National Media Museum at Bradford. 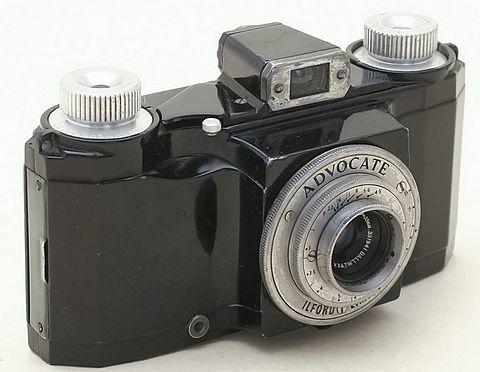 Another exhibit states that the Advocate was popular with commercial 'beach photographers' in the 1950s, because of its reliability and robust construction. Its comparatively wide-angle (35mm focal length) lens was also useful for taking family groups. 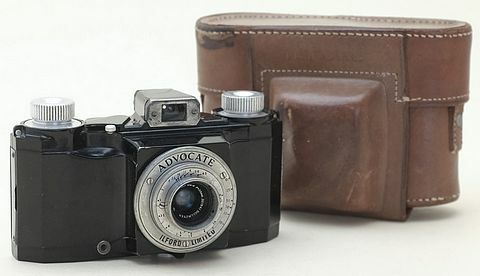 By December 1954, the Series 1 Advocate was being sold via discount advertising at the rear of Amateur Photographer. The December 1954 edition carried an advert by Harringay Photographic Supplies asking £15 (no case mentioned). The same price was being asked by 'Heathcote, of Radford Rd, Nottingham, claiming their Advocate stock to be 'shop soiled', a useful euphemism to explain away discount pricing at a time of retail price maintenance. Michael Rickards has supplied the images below of his Series 1 Advocate. 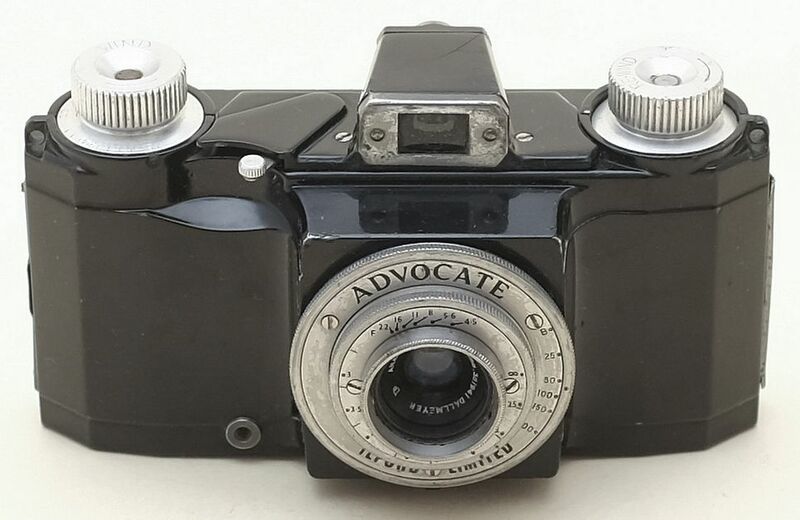 It is an early Advocate Series 1a, body serial No.1919 534, with a chrome film pressure plate. A chrome film pressure plate and body serial No.1919 534, makes this one of the earliest, known as a Series 1a. 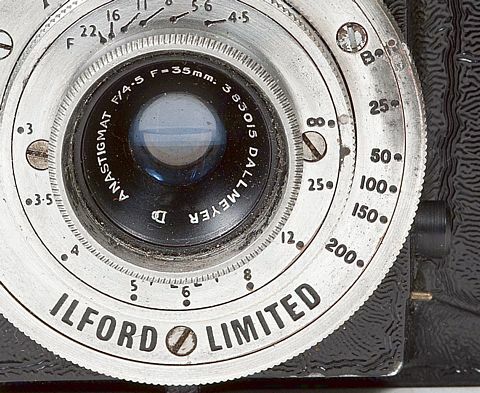 Note the 'silent salesman' sticker advises "Always use ILFORD HP3, FP3 or PanF 35mm Miniature Films". Victor Saltmeris has an even earlier Series 1a, seemingly the 39th ever built (see below); only one older Series 1a is understood to still exist. 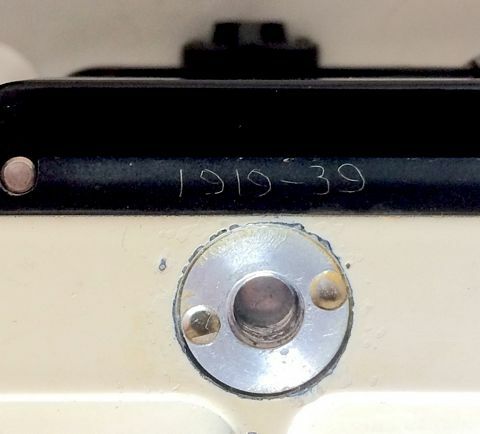 All Advocate body serial numbers begin with 1919. A possible reason for this, as was conjectured by David Gardner and Andy Holliman in Andy's book "The Cameras of Ilford", is that it may have been in tribute to David Kennedy's daughter, Joan, who was born in 1919. View inside Victors early Series 1a. The film take-up spool and (to the left) the geared 'film sprocket' spool, are both in unpainted metal. 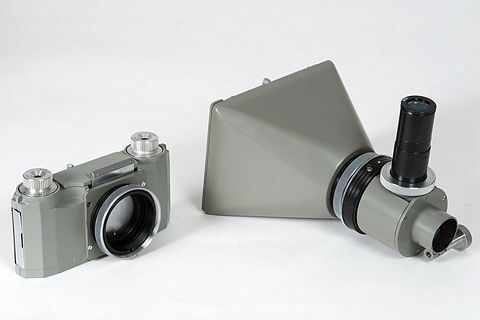 Compare these to the painted equivalents in Michael Rickards Advocate 1a, above, which was manufactured almost 500 cameras further on in time. Notice also that the roller diameters are of larger diameter than the painted ones. The film pressure plate (not shown) is also unpainted, the same as Michael Rickard's. 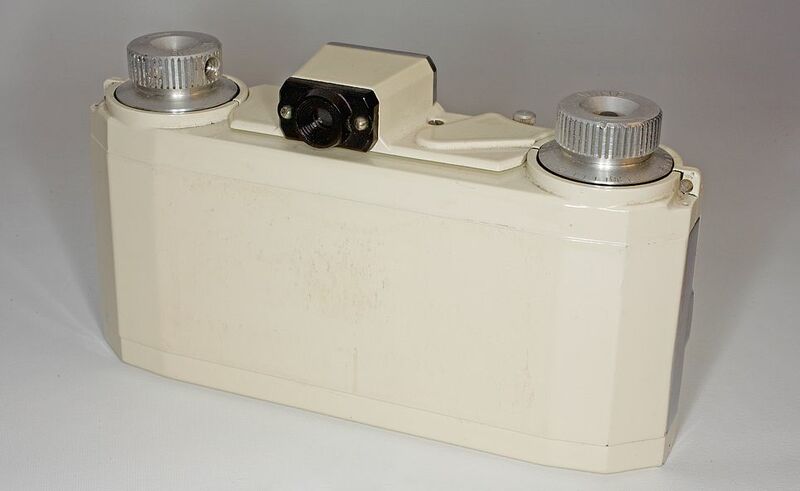 It seems Kennedy Instruments (perhaps adviced by Ilford) decided to start painting the take-up rollers and then, later, the film pressure plate. Both of these modifications may have been done to avoid stray light fogging the film, though there is undoubtably an aesthetic gain. Victor Saltmeris also notes another small but interesting difference with his very early Series 1a, apart from the unpainted film rollers. The word FEET engraved on the shutter is very much smaller than can be see on later cameras. Although only a cosmetic change, the later cameras with FEET printed large are far easier to read. Shown below are pictures of the Advocate Series 2. Taken by PCCI member John Dodkins using his Canon 5D. The lighting set-up was by 'Dunk'. 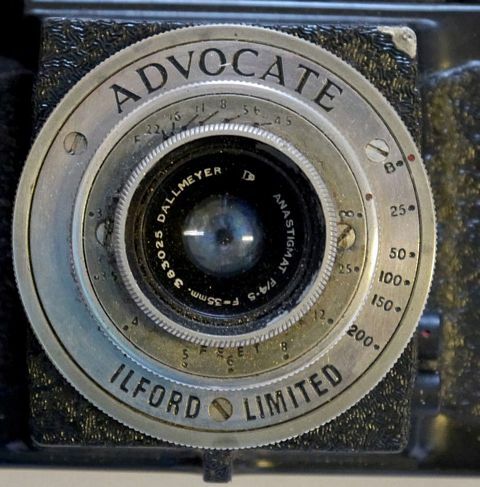 "The attractive stoved white-enamel (ivory) finish of the Ilford Advocate is by now so familiar as to need no introduction. The camera is a simple non-interchangeable lens miniature for 35mm. 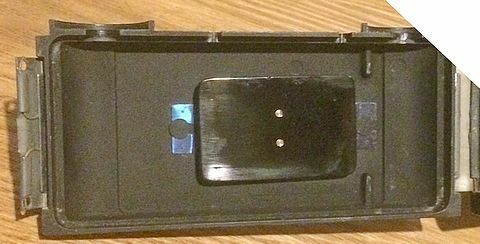 film, giving 36 standard-size negatives on a normal cassette loading of film. The body is a die-casting in aluminium alloy and is a very fine piece of workmanship. 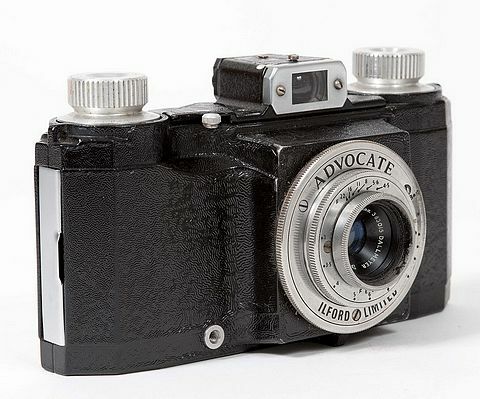 This new model of the Advocate has been improved by the fitting of a lens of maximum aperture f3.5 in place of the former f4.5 lens. 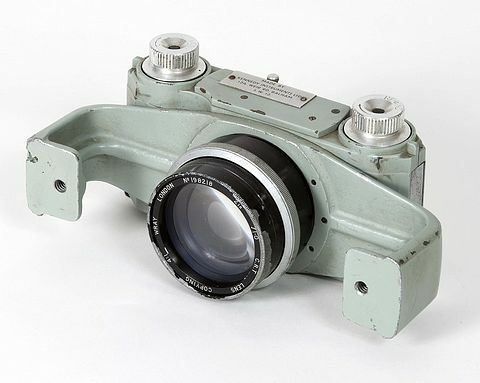 The focal length of the Dallmeyer anastigmat is, like that of the previous model, 35mm., which gives a rather wider angle of view than is generally considered normal, together with greater depth of field. At f4.5 with the lens set to 25ft, substantially sharp focus is given from 12ft. to infinity. Winding on the film automatically set the shutter for the next picture. In addition to the new lens the scale plates have been modified to make them more easily read and the hinge and lock mechanism has been slightly modified. The shutter is synchronised for flash, and using it at 1/25 sec. all the following bulb types can be used satisfactorily; No. 5 and S.M., PFS, PF 14, PF 25, PF 38, and PF 60. 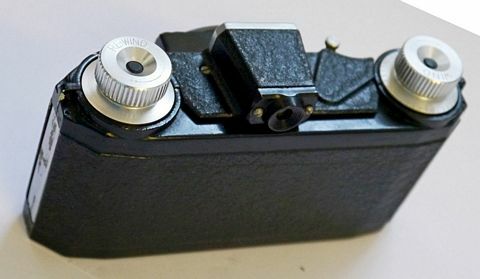 The connectors for the flash gun are fitted to the lower RHS of the lens mounting block as viewed from the front (a flash lead was supplied with the camera to fit the two, non-coaxial, 'female' sockets). The shutter release, which is mounted conveniently for operation by the forefinger of the right hand, is extremely light and the direct-vision finder gives a bright image. A good point of design is the eyepiece of the finder which is moulded in black plastic. Only too often this tiny part is finished in bright chrome or polished metal and is very distracting. 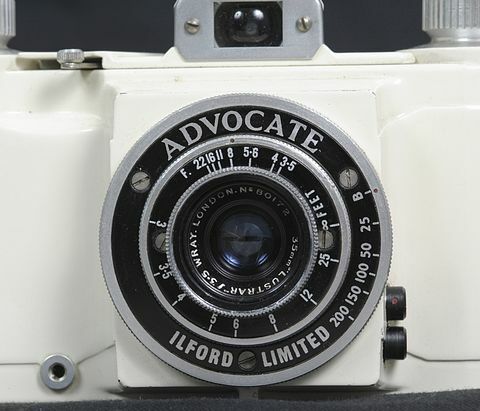 In all, the Series II Advocate is a well-made, excellently finished camera with a wide range of uses. The price is £18 15s. plus £8 2s. 6d. purchase tax (£26.88p)." The Advocate measures, overall, 5"x2.25"x2.675" and weighs only 18 ounces (510grammes). 'Ilford News' for Summer 1953 contains comment relating to tests carried out on the Series 2 Advocate by 'Amateur Photographer' magazine for 2nd April 1953. It also shows various lens accessories. 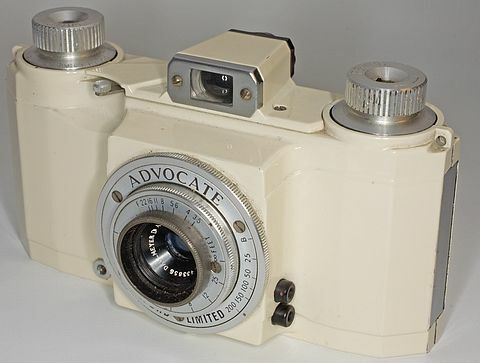 During the production life of the Series 2 Advocate, some cameras were produced fitted with a Wray f3.5 lens due to the limited output of lenses available from Dallmeyer. This model has black coloured co-annular rings surrounding the lens with shutter speed and aperture numbers inscribed in white. Because of this, it is sometimes referred to as the 'black face' Advocate. My thanks to Doug McKee for the picture shown left. Kennedy Instruments stopped making the Advocate around 1955. Its design had apparently not suited the public taste and its lens cost made the retail price too high. Its believed the total production run was around 10,000. The Kennedy Instruments factory making Advocates closed in 1956. Interestingly, it seems some Advocates were still being sold by an 'end of line' store, Direct Photographic Supplies Ltd, 224 Edgware Rd, London, W.2, as late as November 1968 (Ref: AP magazine advert page 96) under the heading 'Miscellaneous Bargains'. Complete with a case, Advocates were being sold for £10.10s (£10 50p). The advert doesn't specify whether the offer was for a Series 1 or a Series 2 Advocate. Andy Holliman, in his book "The Cameras of Ilford Limited, 1899-2005, page 99, draws attention to a few (Andy suggests six) Advocates (f4.5) being made by employees of Kennedy Instruments for their own use. They were not finished in the standard cream enamel but had a black, slight wrinkle, finish applied. Doug McKee has supplied the photos below and comments that the camera shown "has no (body) serial number and is almost certainly an Employees Special, as mentioned in Andys book". 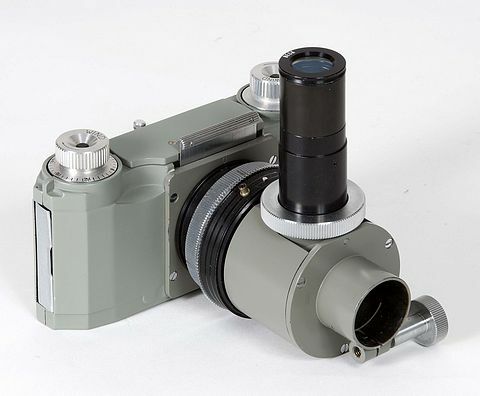 Note that this Employeee Special, although fitted with a Mark 1 f4.5 Dallmeyer lens, has the Mark 2 flash synchronisation connections; see lower right of the lens panel. The external covering of the lower flash contact appears to be missing. Doug McKee comments "... the body of the Black Advocate is 100% Mk2. It has all the features, small tripod bush mount, no holes to engage with pins on the back securing clip (which the Mk1 has) and has flash contacts". 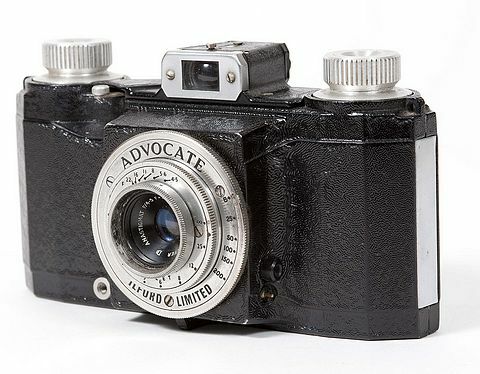 Below are more pictures of a 'black crackle' finish Advocate Series 2 body with a f4.5 Dallmeyer lens, the same as the above and hence likley to be another Employee's Special. Victor Saltmeris owns another unusual Series 1 Advocate, as shown below. This one has a smooth black enamel gloss finish, as compared to the black wrinkle finish of the Employee Special, as shown above. 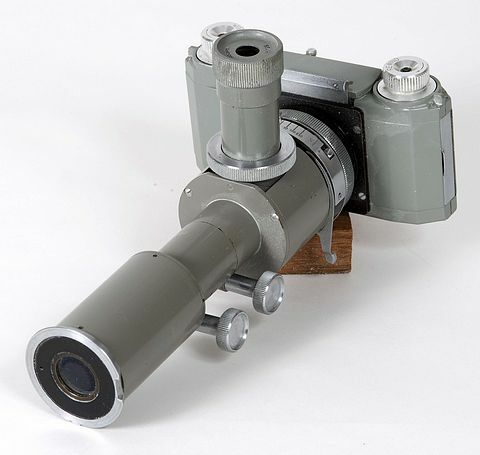 The body has some similarities to the Watson Barnet microscope camera (see below), though the Watson Barnet uses a Series 2 body and was never intended, or equipped, for conventional photography. 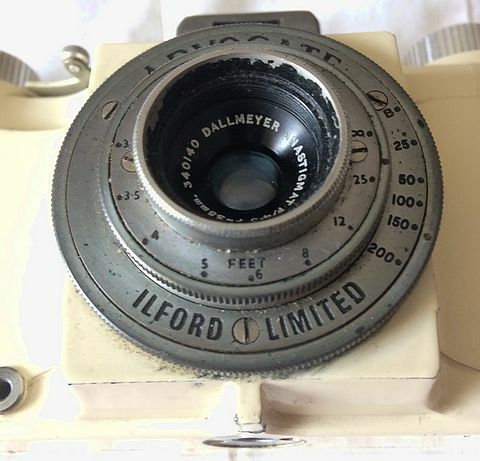 Unfortunately it has no body serial number, though the f4.5 Dallmeyer lens bears the serial number 351941, which fits it into the earliest Advocate range (see David Gardner's survey below), designated by Andy Holliman as Series 1a. These are expected to have a chrome finish to their film pressure plate but, as can be seen in one of the images below, Victor's Series 1a has the later and more conventional black finish pressure plate. The tripod bush is external to the body, as with all Series 1 Advocates, but with just a single securing screw (see below) rather than two, and this one screw is fitted in-line with the lens, rather than in-line with the body. The body's back catch is conventional Series 1, using two locating pins. 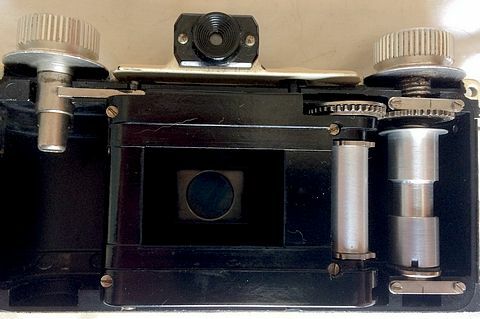 "The camera has all the main characteristics of a Series 1 camera, and the lens serial number would place it as an early Series 1a, in which case a chrome pressure plate would be expected. 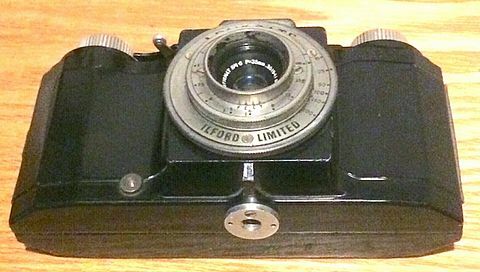 I know of only two other cameras with (lens) serial numbers 351XXX and they are early Series 1a with camera (body) serial numbers 1919-807 and 1919-886 (and chrome pressure plates). 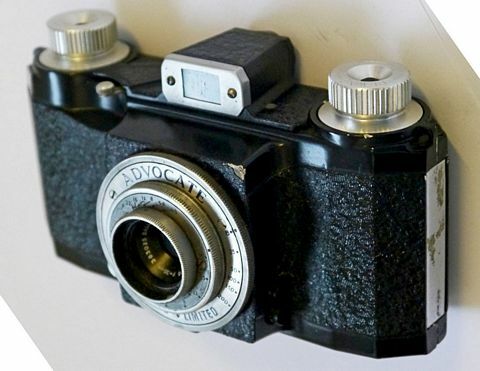 The black body colour is of course the outstandingly odd feature and makes it a very rare camera; there are perhaps only 6 black cameras that I know to still exist and at least one of them has been hand painted! One of these also appears to be an early Series 1a. It is a real shame that there is no body serial number because that would locate it in my series (see David's survey results, below). I am inclined to think that this camera was a factory camera, because it has no serial number and a non-standard tripod bush, and was perhaps made to test the possibility of a black finish, or it may have been a scientific body (many of which were black) which was assembled (at some point, officially or unofficially) as a standard camera for staff use. 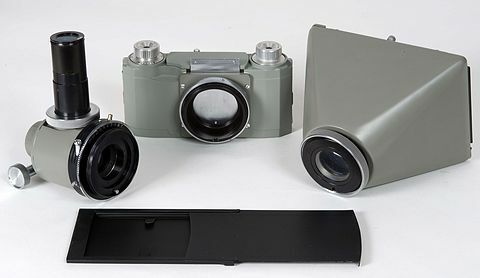 The body, pressure plate and shutter/lens may not of course be contemporary and could have been just parts that were in stock at the time and assembled to make the finished camera. A very interesting find indeed, especially to us Advocate enthusiasts." Victor points out another unusual feature of his smooth black bodied Advocate Series 1a. There are two focusing scales ! By examining the photograph to the left its possible to see that apart from the usual circular black marker dots alongside e.g. 25 (feet), 12 (feet), 6 (feet) and five (feet), there are also some inscribed 'dashes' just to their left. The conjecture is that this Advocate, whatever its original purpose, seems to have been calibrated both for infrared and also for standard film. Another unusual feature is the lack of a 'silent salesman' Ilford film advertising sticker on the inside of the rear door. Another unusual Mark 1 Advocate, owned by Doug McKee. He believes this to have been the property of the UK's Ministry of Education. The text and table below are a summary of an article published by David Gardner in Photographica World (PW), the PCCGB Club journal. 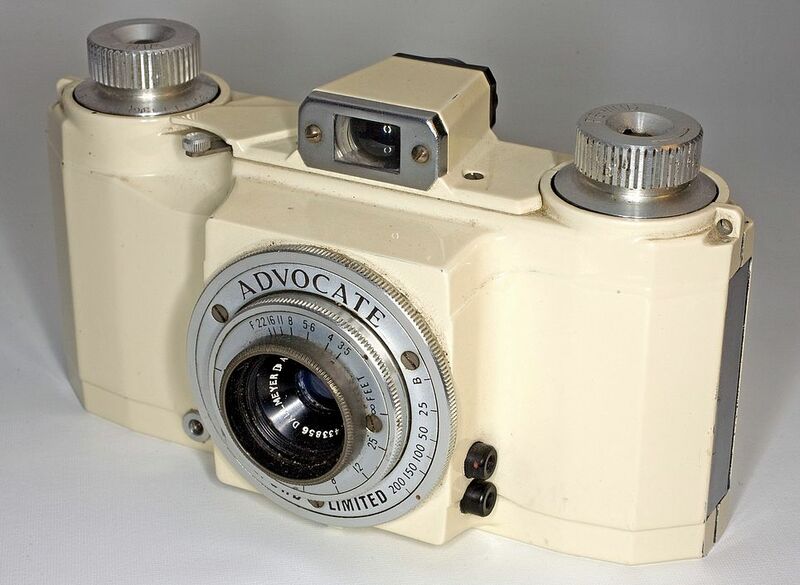 The Advocate had a life from 1949 to the early 1960s, although manufacturing probably ended around 1956 when Ilford/Kennedy Instruments moved onto making the spectacular Monobar (see PW No134 or here). Cameras regularly appear at camera sales, auctions and of course on various Internet-based auction sites. There are also many cameras in members' collections, not least because it's nice to have something other than black cameras on the shelf. All these sources have been plundered over more than 10 years to gather data and with a sample of just over 2.5% of production some reliable conclusions can be made. These numbers are 'smoothed' to ignore 'rogue' cameras whose body or lens numbers are outside the range of serial numbers that fit the obvious sequence. Total production is estimated at 10,000 cameras in round numbers, with 5,000 in each of the official Series. David's sample includes almost the same number of Series 1 cameras as Series 2 and as this is a totally random sample based purely on which cameras he came across, it suggests that both versions have survived in equal number. The Series 3 is clearly the rarest of the production versions - David only knosw of 26 examples of the estimated 370 that were made. In many ways this article draws to a successful conclusion a long period of research and no longer will every Advocate have to be dissected to reveal its Series and internal variations; but rather frustratingly, a major mystery remains unresolved - when did the Series 3 cameras come onto the market - with or after Series 2? The data that enabled this analysis to be done have been collected from very patient Advocate owners, sometimes club members, sometimes eBay vendors, sometimes responses to the online survey kindly hosted by Maurice Fisher on his (this) Photographic Memorabilia website (the survey webpage was discontinued 26th October 2014). Some are known and some are anonymous  to all of you, thanks, you have helped to add a little bit more to the record of British camera manufacturing. Also thanks to Andy Holliman. His book Faces, People and Places - The Cameras of Ilford Ltd. 1899 to 2005 by Andrew J. Holliman, ISBN: 0-9545342-1-2 is unfortunately now out of print, but your local library may have a copy (and if there is enough interest Andy might be persuaded to make it available again on a CD!). 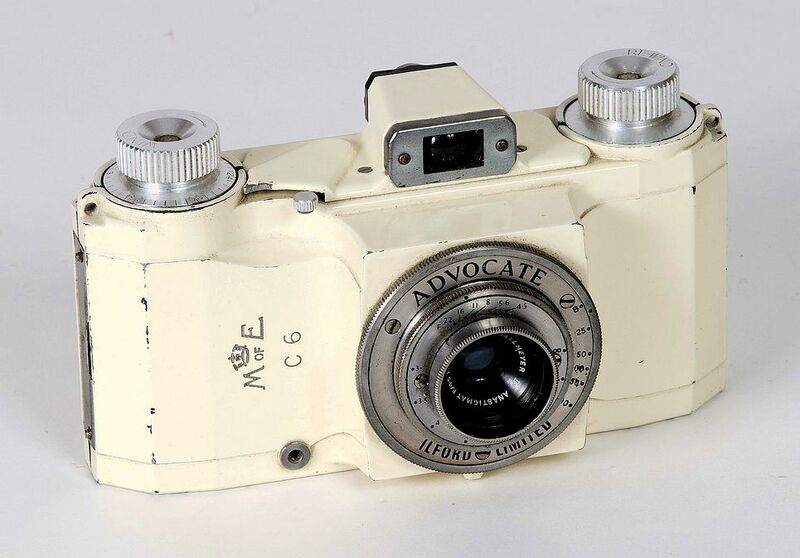 A number of Advocate bodies were used as the basis for special-purpose models for industrial and medical use. The images show right and below relate to an Advocate body modified to attach to a Watson Barnet beam-splitter device instead of being fitted with a conventional shutter and 'taking' lens. This suggests it was intended for use in photomicroscopy. Doug McKee has given me permission to use the following images of equipment he owns. I also acknowledge that some of these images were taken by John Marriage, editor of Photographica World, the quarterly Journal of the Photographic Collectors' Club International (PCCI). The picture alongside compares a normal Advocate (in this case a Series 2) with an Advocate body modified for use with the Watson Barnet equipment. The modified camera has smart black paintwork. 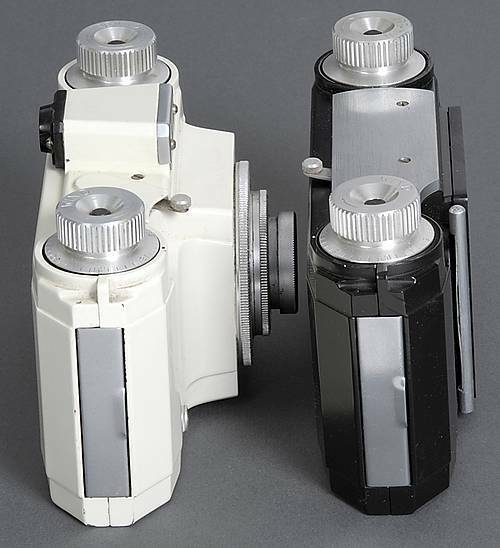 The modified body (right) has no viewfinder; it has a blanking plate fitted in its place, with what looks like a shutter release lever protruding from the rear of the body, rather than from the front, as on a standard Advocate. 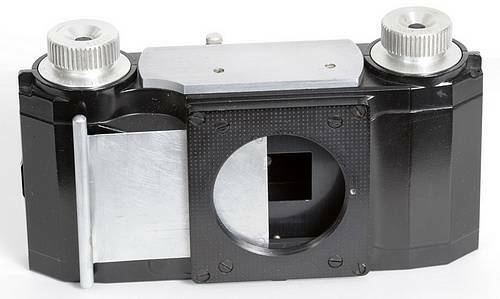 However, its use is different; it is used to release the film wind on mechanism (an action normally interlocked with the Advocate's shutter; but in the modified body, that shutter is not fitted). There is no tripod bush on the base, just a recess where it would be. 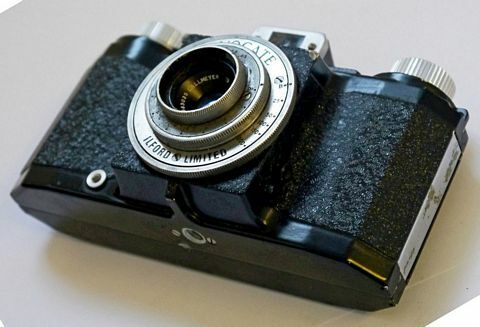 The front of the body casting, where conventionally the shutter and 'taking' lens would be mounted, has been 'skimmed' and a plate to contain a dark slide has been fitted. In the picture alongside, the dark slide is about 60% withdawn. In use, the dark slide would be kept fully closed until the time for making an exposure, when it would be fully retracted. 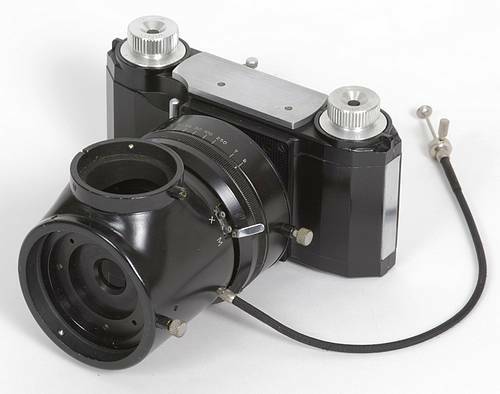 Exposure would then be controlled by operating a conventional 'behind the lens' shutter, fitted to the rear (the camera body connecting end) of the Watson-Barnet microscope attachment (see below). (a) it has a shutter at the back (the end nearest the camera) with speeds of 1-1/250sec, T&B. It has M & X flash synchronisation. (b) the beam-splitter diverts part of the incoming light through a right angle, to an upward facing eyepiece viewing system. The rest of the light is able to pass straight through and into the camera body (via the dark slide, when opened). The clamp ring at the front of the beamsplitter accepts any one of three microscope adapters (though these might not be the same in all instances of the Watson Barnet attachment). 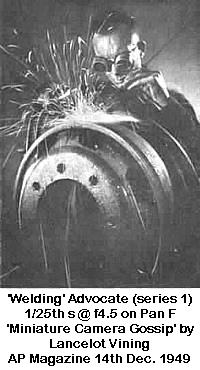 Their internal diameters are 25mm, 28mm and 29mm. This would enable the camera, with its beam-splitter, to be attached to a variety of microscopes. 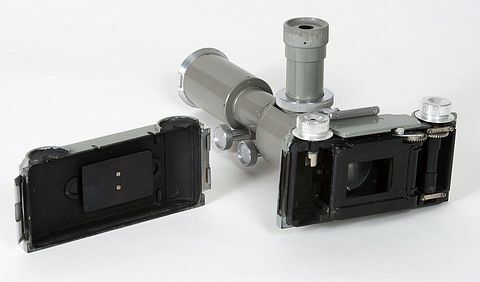 The example of the Advocate camera and beam-splitter shown here, has two viewing systems that attach to the upward facing 'eyepiece' tube of the beam-splitter. 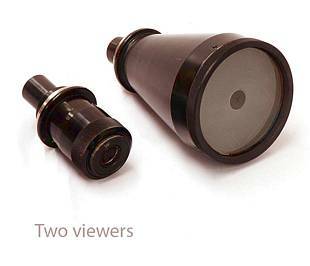 The smaller fitting (see picture, right) is a microscope eyepiece in a focussing mount. The larger viewing system (extreme right) projects the image from the beamsplitter onto a ground glass screen. It has a frame marking similar in shape to 35mm film, but larger - 50mm wide. 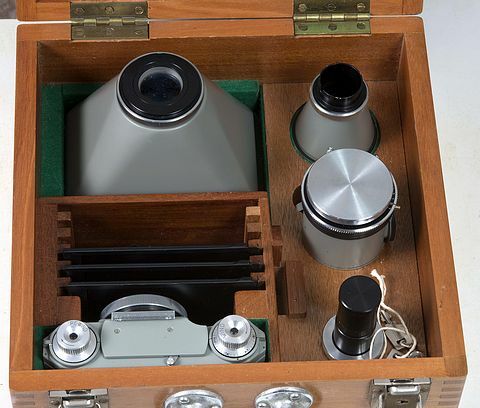 The whole (of this particular outfit) is contained within a fitted wooden case. 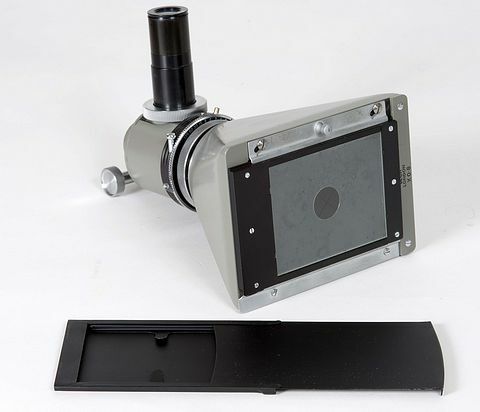 It contains partitions able to retain two camera bodies for working with the Watson Barnet photomicroscopy equipment. These pictures, above and right, are of an unboxed example. Below are pictures of a boxed example. Both are by Beck of London. The viewing screen (as right) can be replaced with a sheet film holder. An Advocate modified to enable recording of a display on a Cathode Ray Tube (CRT) oscilloscope.